What do you call a group of dairy longshoremen who put on white uniforms, don straw hats with colored ribbons, and carry wheels of cheese to and from a 14th Century weighhouse on wooden barrows suspended from their shoulders? 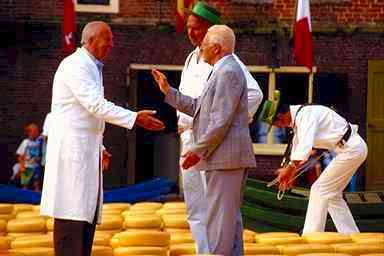 In Alkmaar, they're referred to as "cheese porters" (or the Dutch equivalent), and members of their various guilds have been helping to bring cheese buyers and sellers together for at least 600 years. "These days the manufacture of both cheeses is on such a vast scale that their individual merits have become completely blurred and they are now virtually interchangeable. The cheeses for export share identical, uncomplicated recipes, save the fact that Edam is made from partially skimmed milk whereas Gouda is always made from whole milk. Their minimal aging periods of about two months under identical conditions further serve to negate any detectable differences between them." 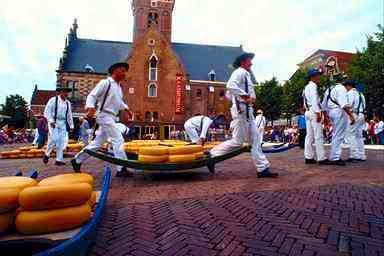 The Alkmaar Cheese Market takes place in Alkmaar's main square every Friday between 10 a.m and 3 p.m., from late March until early September. In recent years, there's also been an evening cheese market on Tuesdays. Tour groups arrive early, so try to be at the market between 9:00 and 9:30 a.m.--especially if you're intent on photographing the action. Alkmaar is just over half an hour from Amsterdam Central Station by intercity train. For more information, see the Netherland Railways journey planner. By car, Alkmaar is 37.6 km or 23.5 miles from Amsterdam. For road directions, pick up a good map and go over it with your hotel concierge. Another option is a group sightseeing tour, which you can book through a travel agency or your hotel. ABOVE: A cheese buyer and seller exchange a High Five. Learn about the cheeses, the market, and the town (including dates and times for the Cheese Market itself). The official Alkmaar tourism site has up-to-date visitor information, events listings, and more in Dutch and English. For information on other towns and sights between the North Sea and IJsselmeer, visit the VVV Heart of North Holland. The Alkmaar Weighhouse dates back to the 14th Century. Today it houses a museum of antique dairy equipment, along with displays that show traditional and modern cheesemaking techniques. The town's historical museum is located in a 17th Century militia armory. Paintings make up the bulk of the collection, but the attic rooms show how Dutch children lived, learned, and played in 1900. A former brewery houses this museum, where you can see exhibits about the history of beer and have a glass in the Proeflokaal "De Boom." If you prefer church music to cheese, forget the Kaasmarkt: Alkmaar's renowned Hagerbeer/Schnitger organ in the Laurenskerk is the city's premier attraction, at least for visitors who enjoy world-class keyboard music. For more information on the church, visit the Grote Kerk Alkmaar Web site and see the agenda pages for news of free "Kaasmarkt orgelconcert" performances. Boat tours of 45 minutes depart from the Mient, near the Cheese Market, from April through October. (You'll need to duck down to clear the 22 bridges along the route.) The exact schedule depends on the season and weather. After you've bought a pallet's worth of cheese, turn to this packing, shipping, and air-cargo company for help in getting your purchase home. And you thought there wasn't anything to buy in Alkmaar except cheese and souvenirs. Our 29-page Web guide has links to Amsterdam hotels, apartments, restaurants, museums, coffeehouses, entertainment listings, local transportation information, and more. Top inset photo: VVV Alkmaar. 2nd inset photo: Monique Stap for VVV Alkmaar.